THEY’VE BEEN FRAMED! Regional Communications Director Matt Schneider talks about the local art at The New Marshfield Medical Center-Eau Claire Hospital, including this piece by Tom Gardner of Eau Claire. Those visiting the new Marshfield Medical Center-Eau Claire Hospital may notice the pristine design or the state-of-the-art technology, but what they might want to look more closely at is the artwork on the walls. This art serves as a means of comforting, engaging, distracting, and calming visitors. “Doing this well creates a harmonious, healing environment that is beneficial to all who are interacting within it,” said Bobbie Erwin, New Visions Gallery director, who helped select the pieces on display. Of the 180 pieces of art located throughout the new Eau Claire hospital, 150 of them were created locally. Erwin made trips to Eau Claire to find artists and artwork that promotes a healing environment. Erwin and her team worked with Artisan Forge, among other places, to find artists such as Andrea Wolfe, Pat Hamm, Tom Gardner, Faith Esser, and Jo Burke, to name a few. “The artists in Eau Claire have greatly assisted us with not only sharing their talent but also understanding that we have some different needs, being a medical facility,” Erwin said. 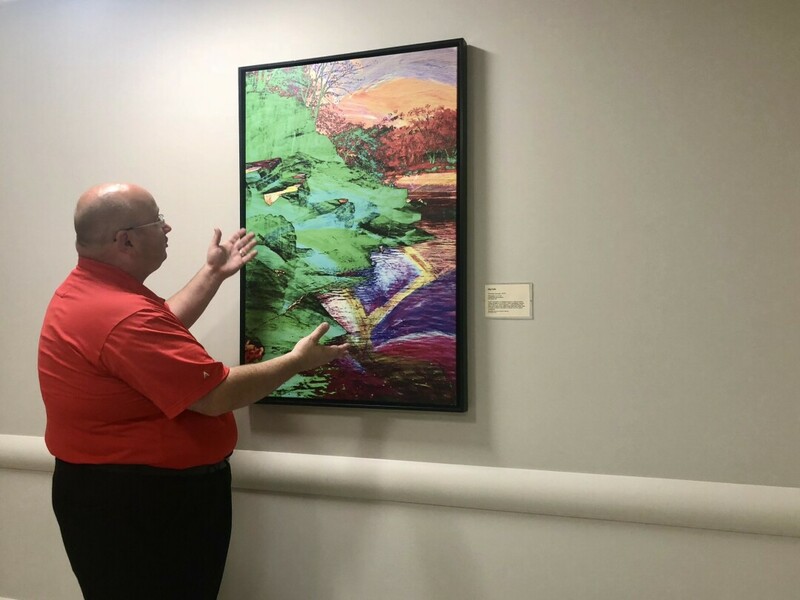 The hospital brought artwork into the facility as a means of creating a “healing environment,” regional communications director Matt Schneider said. They want to ensure the artwork facilitates good feelings. Artwork is displayed all over the building, including on the walls in the public spaces and in the patients’ rooms. The art gives pops of color and creativity to the otherwise monochromatic walls. One piece hangs from the ceiling in the first-floor waiting room. The piece is kinetic, in hopes of giving visitors something to look at and potentially take their mind off other thoughts. After the public self-guided tour in June, attendees professed their excitement for the local artwork on display. “Marshfield Clinic did a profound, beautifully radical thing when they chose to incorporate the affective qualities of art into their vision for healing,” said Tom Gardner, one of the featured local artists. Gardner, who has seven or eight pieces hanging in the hospital, said art is created with optimism. He said he hopes other medical facilities follow suit in purchasing art from local artists.